In a place long forgotten by time, a place where summers can last decades and winters a lifetime. Winter is coming and a game of thrones is about to begin. Sinister and supernatural forces are fighting their way back with the winter. Across the lands, the families of different areas go to war. Who will end up on the iron throne in the end? Well everyone has heard of The Game of Thrones tv show and the world is obsessed and hooked on it. 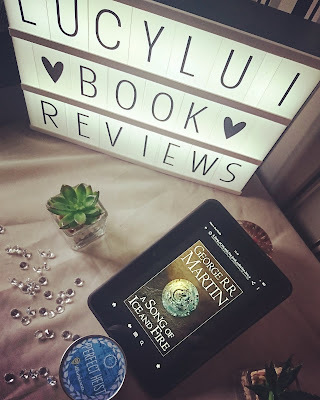 The tv show was adapted from the series of books by George R R Martin and if you think you enjoyed the tv show then you're going to love the books. Just from looking at the size of the books you will realise that not everything in the books could possibly fit into the tv show. So be prepared to be amazed. The book goes into so much more depth and is just fantastic. Amazingly written with an amazing plot and characters. This book has a bit of everything in it. History, Fantasy, Supernatural you name it, it's in there. A great book and I cannot wait to read the rest in the series. If a book ever deserved a five-star rating this is the book.